All schools today depend on the volunteer efforts of their families. LPS is no different. Please consider how you may help with your time or resources. . .
Love activities? Volunteer for the Special Events Fundraisers. Want to expand the LPS family? Help with Grandparents/Grandfriends Day. Interested in development? Serve on the Family & Friends Fund Committee. Got a green thumb? 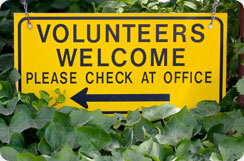 Join the Greenhouse Volunteer Committee. Come to a Parent Council meeting and take one action item. Serve on the Parent Council. Volunteer for one of our many programs. Help implement one Parent Council activity. Need more ideas? Contact the Parent Council or Alex Magay, Director of Development.